At a recent canning demonstration and luncheon I attended at Local 127 in downtown Cincinnati (more details about the luncheon coming up next week), I was chatting with Chef Geddes about the flavor profile in the dessert he served. 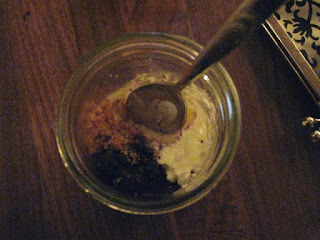 It was, in his words, Cheesecake in a Jar with Blueberry Compote and Crème Fraiche. It was, in my words, divine, and absolutely perfect after the incredible lunch we had just eaten, but it wasn't your traditional overtly sweet dessert. I was particularly curious about the blueberry compote. The blueberries tasted like blueberries, but they didn't have their traditional sweet/tart flavor burst. They did have an acidic flavor that balanced well with the creamy cheesecake, but the acid was not that of a citrus fruit like lemon but of vinegar. There was also a slight undertone of something else...something herbaceous and floral but not overpowering. So I asked Chef Geddes about the secret ingredients. How incredibly smart, I thought. And how refreshing to not have sweet on top of sweet at the end of a meal. I appreciated the creativity of the entire meal (more pics next week in my review of the luncheon) and the use of fresh, local ingredients. My compliments to the chef, of course. 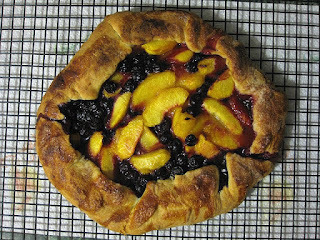 In homage to that dessert, I decided that a sweet and savory galette was my next project. It was entirely experimental, as all things tend to be in my house, but I did find some inspiration by checking out some fruit galette recipes from Smitten Kitchen and Rose Levy Beranbaum. I didn't want it to be overtly sweet so I scaled back on the sugar amounts, and I didn't want the crust to outshine the fruit so I chose a more savory sour cream crust that was recently featured in Cooks Illustrated. The end result was almost exactly what I was going for. I think I could have gone with a tablespoon or more of sugar, but the fruit was really the star here. Give it a try if you are feeling daring in the kitchen--and feel free to make any small adjustments by subbing a different fruit or increasing the sugar. If you have a success story, please come back and share it with me! *The peaches I used for this recipe were slightly firm and I was worried they would not be ripe enough, but I thought they perfect as far as flavor in the finished galette. Over-ripe peaches may be slimy and not hold up well in baking, so lean towards to firm side. Also, this is positively sinful with a scoop of vanilla ice cream. Should you decide to be extra daring and make your own, may I recommend David Lebovitz's Vanilla Ice Cream recipe. Add flour, salt, and 1 tsp sugar to food processor and process until combined. Cut very cold butter into 1/4 inch cubes and add to food processor. Pulse until butter is the size of large peas (about 10 pulses). In a separate bowl, mix sour cream and ice water until combined. Add half of the sour cream mixture to flour mixture. Pulse for about 3 seconds. Repeat with remaining mixture. Pinch dough with fingers. If it is floury and dry and does not hold together, add 1 tbsp of ice water at a time, and process until dough forms large clumps and there is no dry flour. Turn dough onto floured work surface and form into a disk. Cover in plastic wrap and refrigerate for at least 1 hour. During this time, make the filling. After you are finishing chilling the dough, remove from plastic wrap on a floured surface and roll out to a 12-14 inch circle. This does not have to be perfect because this will be a sort of free-form pie. Set aside on parchment paper until you are ready to fill. Preheat your oven with a pizza stone in it to 400 degrees F. Bring a large pot of water to a boil. Cut a large X in the bottom of each peach, as demonstrated here and then add to the boiling water. Allow them to boil for 30 seconds to 1 minute. Set aside peaches to cool until you can safely handle them, and peel back the skin. If it does not come off easily, that's okay! Just use a paring knife to help slip the skin off. Cut the peaches into wedges and discard the pits and skins. Set the peach wedges in a mesh strainer and add a pinch of coarse salt and the lemon juice and toss it together. Set the strainer over a medium bowl allow to macerate for a minimum of 30 minutes or up to 1.5 hours. When the peaches are done macerating, pour the accumulated juice into a small saucepan with 2 tbsp butter and allow to reduce to half on medium for about 5 minutes, or until it's syrupy. Meanwhile, put the peaches back into a medium bowl and add the blueberries. Toss with corn starch, 3-4 tbsp sugar, and the reduced juice. Add the filling to the center of the rolled out pie dough, taking care to leave 3-4 inches of dough around the sides as a border. Take the edge of the dough and fold it over toward the middle, about 2-3 inches over the fruit filling. Continue this all the way around the sides, crimping and pinching the dough so that it holds itself up around the filling. Brush the crust border with the egg whites and sprinkle the last 2 tbsp of sugar over the crust. Bake on a pizza stone (or a baking sheet if you don't have a pizza stone) for 40-45 minutes or until the filling is bubbly and the crust is nice and brown. Remove from oven (try using a pizza peel if you are having trouble taking it out) and set on a wire rack to cool slightly. You may want to place a paper towel or dish cloth under the wire rack as the fruit filling may slip through any cracks in the crust. Can be served warm with a scoop of ice cream or stored in an air tight container for up to 1 week. I dropped by the garden yesterday to see the ruins of what was our garden. Tim had gone by there last weekend and told me that it wasn't going to survive and not even our little watermelon plant was going to make it. He suggested that I not even go to look, knowing that it would definitely be a storm cloud over my hopes of a bountiful harvest. I had to see it for myself. Every plant was dried up and crispy. The weeds, who can survive in any drought or any type of soil, had completely overtaken the plot. You could not even see any proof of the hours we had spent trying desperately to hold those weeds back and protect our little seedlings. It is time to admit defeat. In reflection, all is not completely lost. In fact, I learned quite a bit this summer about plants, how they grow, what they need, and good techniques for gardening (even if we didn't know before we planted how to implement them). No amount of books or google searches could have taught us what we learned just from experience. I'm going to log a few things that we are going to do differently here, and I hope they might help you too if you decide to plant next year. Add compost to the soil before planting. To control weeds, lay a black tarp down over the garden plot and cut out holes only for plants to come through (as described in this article). Watering plants in the early morning is more effective than afternoon or evening watering, and can help prevent diseases. While a community garden sounds like a fantastic idea, it may be even more of a commitment than a garden in your back yard because of the distance from your house. As a beginner gardener, it might be easier to focus on a few types of plants, rather than a big variety. It's more fun to be successful at a few things, than a failure at many! *Note: I'm not a horticulturist, so my suggestions may not apply to everyone. I'm just a beginner gardener, trying to learn from my mistakes! Out of nowhere, I get this itch in my fingers and toes to do things. Once on a whim I went camping with a friend in January. It was somewhat warm during the day but incredibly cold at dark. I shivered the entire night. Another time I picked up and drove to Chicago on New Year's Eve. I danced until after midnight, then walked with no jacket and high heels around Wrigleyville spreading some New Year's cheer with my girlfriends until well after 4:00 am. It was my second best New Year's Eve (my best was my engagement to Tim). In our first apartment, I decided Tim and I should do some painting. We picked out the colors and spent an entire day putting coat after coat on the plaster wall. 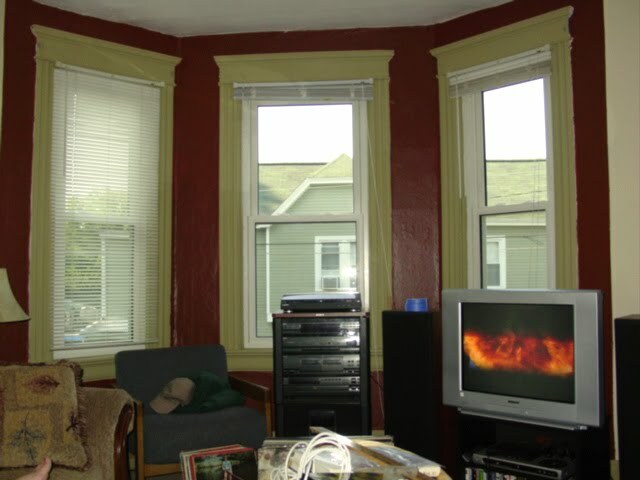 I even have the before and after of that room. I think the color made an impact. We loved that little apartment--listening to vinyl, playing dominoes, and it's also where Tim proposed to me--right in front of that window on New Year's Eve. We learned to cook together in that apartment, too. I give a lot of credit to Tim, who had a little more experience in the kitchen than me. He can whip up a mean Tuesday night stir fry. I did my part by perfecting the art of meatloaf. I heard on The Splendid Table radio program that you should make meatloaf the way you'd make a meat ball with lots of fresh herbs. So that's what I do, and my meatloaf is fantastic. While we lived at that apartment, Tim took a job as the morning baker at a local store so that he could finish up his degree in the evening. He would toss his work clothes in the laundry basket and when I did laundry I would smell the flour and freshly baked bread on his shirt. He usually does the bread baking at our house but this weekend I got that itch where I needed to bake. I browsed our cookbooks and some of the magazine clippings I have in a file, but nothing was standing out to me. 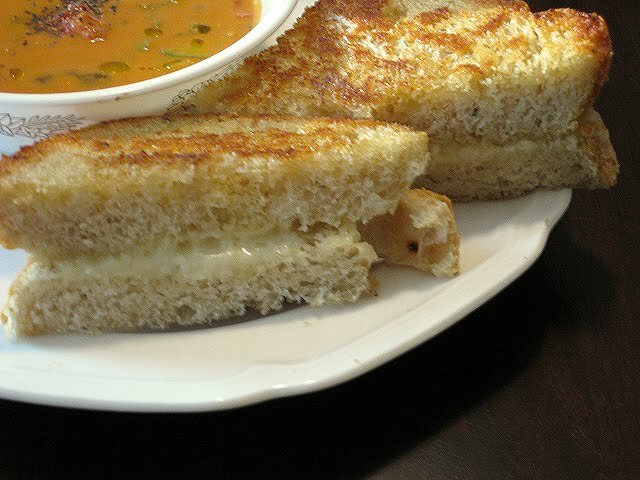 I was in search of the perfect bread to make a fancy grilled cheese ala Courtney at Epi-ventures. 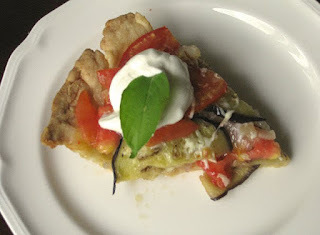 Remembering that I had such success with a basic pie dough from Williams-Sonoma when I made my Tomato and Roasted Eggplant Pie, I decided to check out their website for a recipe. 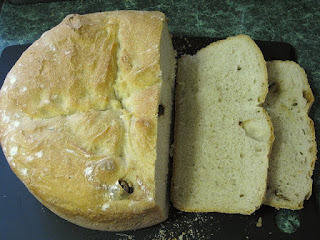 I found a recipe for Rosemary-Olive bread that was closest to what I was looking for, but there were a few problems. The first is Tim doesn't really love olives, so I decided to make some roasted garlic cloves to put in the bread instead. The other is that I don't have a stoneware baker. That was going to be trickier to substitute. I was shocked at how huge the dough was after it rose twice. I had originally planned on putting it in a loaf pan to make it easier for slicing, but it was never going to fit. I made a quick decision. The original stoneware baker that the recipe called for was covered, so I needed a big, oven-safe pot with a lid that I could bake the bread in. I pulled out my dutch oven, greased it, and decided to take a leap of faith. This risk definitely paid off--the bread was beyond my expectations. 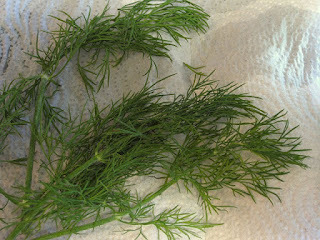 It was light and fluffy with great rosemary flavor. The roasted garlic cloves were like bursts of garlic flavor in a bite but didn't overwhelm the bread. Our fancy grilled cheese sandwiches with Ludlow cheese from Blue Jacket Diary were creamy and crispy, just like a grilled cheese should be. We had slices of the bread along side grilled chicken and summer squash the next night with just a little butter on them and it was still great. It took a lot of steps to make the bread, but if you want to have a huge loaf of bread for a dinner party or for sandwiches, I'd recommend this. It would save you a step if you purchased pre-roasted garlic, but where's the adventure in that? Preheat oven to 400 degrees F. Toss all ingredients together in a small oven proof pan. Cover pan tightly with foil. To use for adding to the bread, bake garlic until tender but not mushy, about 40 minutes. If you are going to use for mashing with potatoes or as a spread, bake for 50 minutes until soft. When finished, remove foil and set aside to cool before peeling. For purposes of adding to bread dough, allow to cool completely on a paper towel. Sprinkle yeast and sugar into the warm water. Allow to stand until mixture is bubbly, about 5 minutes. In the bowl of an electric mixer, add both of the flours, rosemary, salt, and yeast mixture. Fitted with the dough hook, knead the dough on medium until the dough is soft and smooth, about 10 minutes. Turn dough out on to a lightly floured surface and shape into a ball. Return the dough to the bowl, cover with plastic wrap or a clean towel, and let rise in a warm, dry place, like on top of a warm oven, until doubled--about 1 hour. Punch down and then let rise again until doubled, about 45 minutes. On a lightly floured surface, press the dough flat. 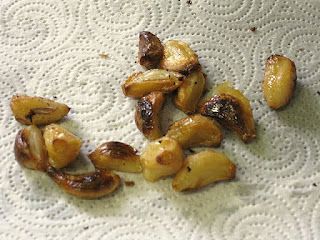 Press the pieces of roasted garlic into the dough so that they are evenly spaced throughout. Then stretch the sides of the dough down and under to form a tight, round shape. Pinch the seam under the dough flat. Place the loaf in a greased and floured 5 quart dutch oven (or stoneware baker). Cover with lid and let rise for 30-40 minutes. Preheat oven to 400 degrees F. Using a serrated knife, but an X in the top of the dough. Cover and bake until the loaf is golden brown on top and sounds hollow when tapped on the bottom, about 1 hour. Raise your hand if you're as happy as I am that it's Friday! The last slice of the Monday Night Cake was eaten yesterday and boy-oh-boy am I ready for the weekend! If you are going to be in downtown Cincinnati today for lunch (or perhaps would love a reason to go), I have good news for you. The newly launched Cooking Channel has created a one-of-a-kind ice cream truck to drive across the country and they are stopping in Cincinnati. Even better, they are not just scooping any ice cream but serving Graeters ice cream for FREE. If you want to check this out today (and with this heat, I can't think of anything more refreshing than ice cream), they will be serving ice cream from 12:30pm-1:45pm at the Scripps Center located at 312 Walnut Street. It's only about 2 blocks from fountain square. If my recent posts have inspired you to seek out some fresh, local produce or meat, then check out your local farmer's market. You can find a listing for all local markets at LocalHarvest.org. Maybe you will find a market that you think I should check out? If so, let me know! Otherwise, I will be at the West Chester Farmer's Market bright and early tomorrow. There are moments in life when cake is completely appropriate. Birthdays. Graduation. Weddings. Monday nights. I came home from work Monday knowing that this week was going to be an uphill battle. Not only did I have several things planned after work but my entire work calendar was blocked out for meetings, due dates for projects, and a lengthy IT overhaul of my office electronics. If Monday was any predictor of how this week was going to go, cake was the only option. A Monday night cake has to be simple. No sifting, no adding ingredients in thirds, no separating egg yolks. This cake only requires a whisk (or spatula), a bowl or two, and one cake pan. 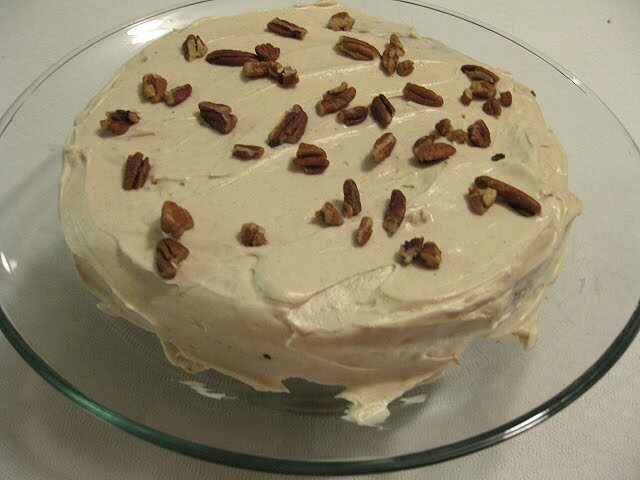 Sure, the frosting is an extra step but you have so much time between baking and cooking the cake whipping up a cinnamon buttercream is no big deal. 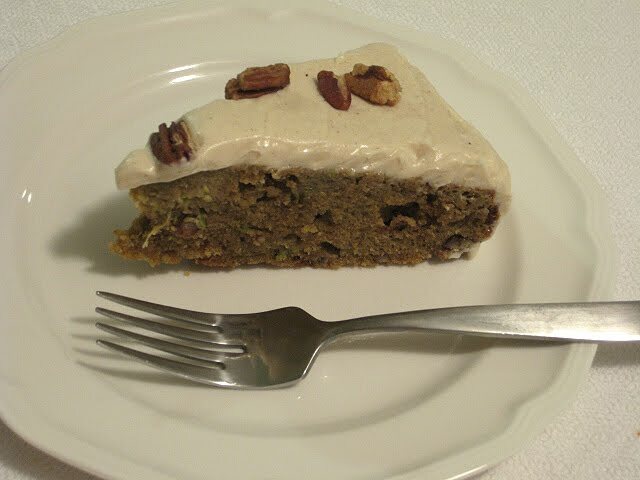 It's an added bonus that this cake's star ingredients are zucchini and pecans. (Readers, does this sound familiar?) Knowing this, you can convince yourself that you are eating a healthy cake. And if it's so healthy, why not just skip dinner altogether and just have cake. You deserve it. *note--I inadvertently doubled the amount of cream cheese from the original recipe and I did think it was a lot of icing for a little cake, but after the day I'd had, the more icing the better. You can opt to cut the amount of icing in half if you'd prefer more flavor of the butter and less flavor (and amount) of cream cheese. This cake could also easily be doubled to make a two-tier cake. Position the rack in the center of the oven and preheat to 350 degrees F. Coat a 9-inch round cake pan with 2 inch sides with non-stick spray. If you have parchment paper, you can cut a piece of parchment paper to fit into the bottom of the round and spray that with non-stick spray. I did not have the parchment and the cake came out of my pan with no issues. Whisk together flour, baking powder, salt, cinnamon, ginger, and nutmeg in a bowl. In a separate bowl, whisk oil, sugar, eggs, and vanilla in large bowl to blend well. 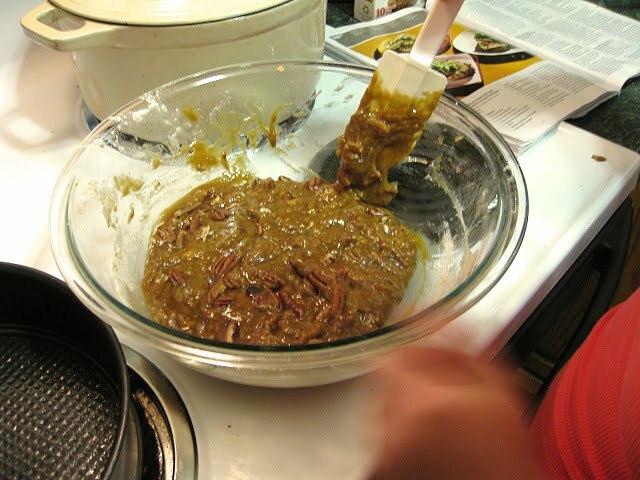 Fold in the flour mixture, then fold in the zucchini and pecans. Transfer batter to the prepared cake pan. Bake cake for about 45 minutes, or a toothpick can be inserted into the middle and come out clean. Cool cake completely on wire rack, about 1 hour. Cut around the sides of the cake with a clean knife to loosen cake from the pan and turn out onto a serving platter. If you used the parchment paper, remove it now. Using an electric mixer, beat cream cheese and butter until blended. Beat in sugar, vanilla, and cinnamin. Spread frosting over cake. Sprinkle additional pecans on top for serving. Sun tea, just like I remember my mom making it. Murray couldn't resist taking a sniff and good a look into the jar. 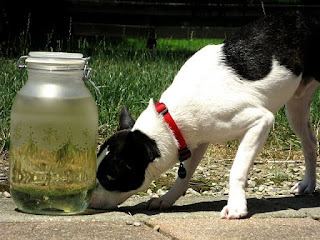 To me, sun tea tastes like diving into the swimming pool, grilling corn on the cob, and catching fire flies. What's your summer drink? I was always the kid with a book under my nose. During summer break I would consume books in the same way I would consume pickles--one after another, an endless appetite. In fact, books and pickles were often in my hands at the same time. With a book in my left hand and a whole pickle in my right, I would sit on the green swing-set in our backyard and read all afternoon, snacking on pickles. Then there was the time I went to Las Vegas on a practically-all-expenses-paid birthday trip for my best friend Abbie. Her dad, our host, is a Vegas expert and took us to lunch at Stage Deli. I can't remember which casino it was in (anyone know?) and we had an assortment of all-things-pickled as an appetizer at our table. I didn't know you could pickle just about anything. My love affair with pickles of any kind was reaffirmed. Adults love pickles too. I think this passion for pickles runs deep through my veins. My grandma always tells stories about her father tipping the pickle jar back to get the last drops of juice. Tim's grandmother Patsy makes legendary pickles. 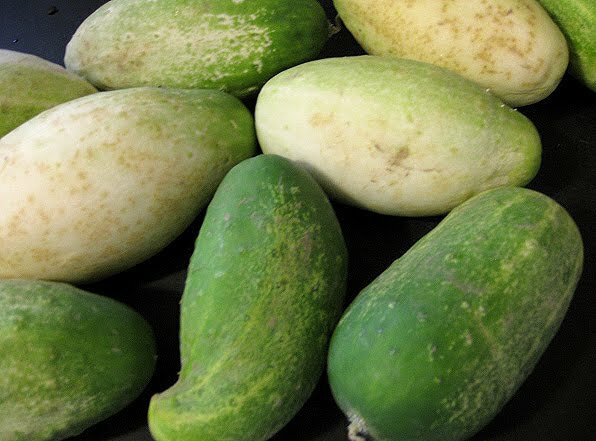 When we were at our family reunion earlier this month, his grandpa Pete was telling stories about a seven-or-eight-year-old Tim and his cousin Nick slicing cucumbers straight from Pete's garden, readying the vegetables for Patsy's family recipe. It makes sense to me that our grandparents and great grandparents would be fond of pickles. Pickling is a great way to preserve produce in order to have some vegetables during the off-season. I gave you a sneak peak two days ago and I'm happy to report that my first venture into pickling was a huge success. This recipe was a good baby step into making pickles, and the incredibly tasty results have given me confidence to try more recipes and techniques. After a bit of googling I learned that our cucumbers were less than ideal for making into pickles. The fact that they had begun turning white means that they would have a lot of seeds--apparently undesirable in pickling. Frankly, this didn't bother me at all. I can't remember having seedless pickles? Or even pickles with small seeds. My advice for this recipe is that the amount or size of seeds was not important. To make sure that there was no contamination in the jars or lids, you can run them in the dishwasher with hot water and detergent or just wash them in very hot soapy water in the sink. We let them dry on the counter on a clean paper towel. While the jars and lids were drying, we sliced the cucumbers into quarters (and some of them into eighths depending on their size). You could also slice them in "chips" like Arena of The Nerd's Wife. 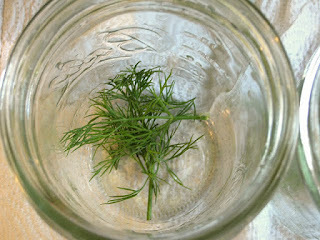 Put a sprig or two of dill in the bottom of each jar. Then start filling the jars with your cucumber spears. We packed as many as we could into each jar. We ended up filling 4 jars to the brim. I can't really remember how many cucumbers we used--it was probably around 10 but they were really fat. The girth of your cucumbers will determine the number you slice. Mince up 3 or 4 garlic cloves and sprinkle those on top of the spears. Tim, being the glutton for punishment that he is, wanted to make a jar of spicy dill pickles. So he dumped some red pepper flakes onto the top of one of the jars (I wouldn't let him do it for any more than one!) and those are an experiment! In a pitcher, you mix together water, apple cider vinegar, and salt. At first it will be cloudy but when the salt dissolves completely it will be a clear liquid. 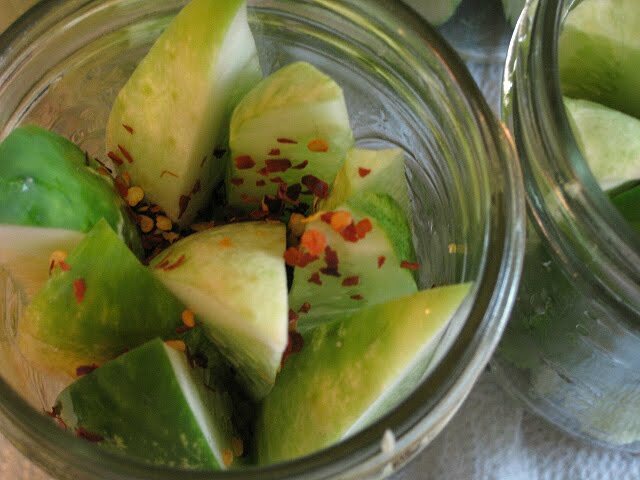 Pour the liquid over the cucumbers in each jar so that the cucumbers are completely submerged. For us, this solution filled four jars exactly. And then you put the lids on them and put them in the refrigerator. No boiling water bath. No fuss. Just wait two days and then test. I finally was able to taste them today and I was kind of surprised at how crisp, salty, garlicky, and incredible these were. They were exactly the flavor and texture that I love when I get a pickle at the deli and so simple to make. I tasted one of the spicy spears and they had a hint of spiciness, but I think maybe they just need some more time in the jar with the pepper flakes to marinate. If you try these out, let me know how it goes! Wash your jars and set aside to dry. In a pitcher, mix together salt, vinegar, and water. At first it may be cloudy but as you mix it will become clear. Put a sprig or two of dill in the bottom of each jar. Add the cucumbers and garlic. Pour the liquid into the jars until the cucumbers are submerged and there is 1/4 inch space at the top. Screw on the lids and refrigerate for 2 days. Best if eaten within 1 month. If you prefer a less salty pickle, only use 2 tbsp salt. If you would like to try a spicier pickle, add red pepper flakes and allow to marinate for additional days. Want to see what we did last night? You (I mean, we) are going to have to wait a while to see if they are good. I promise I will let you know. It goes without saying that summer is the best time for tomatoes. Or do I have to say it? Perhaps someone should tell a certain restaurant that they don't have to serve grainy, watery tomatoes in July. Sure, they made up for it with fantastic happy hour prices and a view overlooking Fountain Square that no amount of lackluster tomatoes can overshadow. But someone tell the chef if they want some good tomatoes, call me and I will send them to my vendor at the local farmer's market. It may have been raining all day today but summer was alive and well in my kitchen. As I sliced into the tomatoes I picked up on Saturday, their deep red juices seeped out onto the cutting board, bleeding their perfect acidity and just begging me to eat a slice quickly and put them out of their juicy misery. Oh summer, never leave me again. How will I live without your tomatoes? Those tomatoes were going into a Tomato and Roasted Eggplant Pie. I picked up the recipe while I was in Virginia at a family reunion. You know you're the family foodie when your mother-in-law, as soon as you get there, says, "I have a book of recipes you might be interested in!" I decided to go at this recipe full throttle. It called for a baked pie shell so I wanted to make my own. 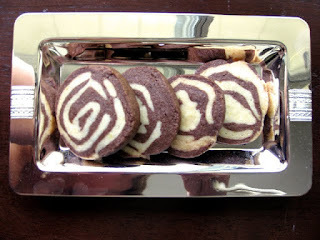 I can't remember where but I saw some bloggers using pastry recipes from Williams-Sonoma. I got out my food processor, measured out the ingredients, the stars aligned, and voilà--a fantastic pie crust. Tim said it was the best he'd ever had as far as flakiness and flavor. He is the resident food critic, so I believe him. I sliced up the eggplant, tossed it with some olive oil, salt, & pepper and roasted it in the oven. I also sautéed the onions until they were soft to avoid any raw onion flavor. The tomatoes just got a thin slice and were added to the pie as is, and they were excellent. 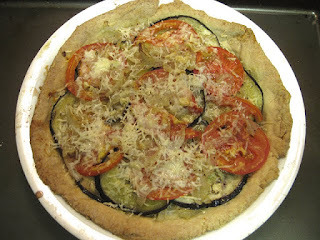 The pecorino cheese and parmesan added a nice saltiness to the flavor and good contrast to the vegetables. Except for the dough slipping down a bit, I can't imagine that this could have turned out any better. In fact, this is the perfect summer vegetable pie. The eggplant and tomato could easily be swapped out for zucchini, summer squash, peppers, potatoes, leafy greens, or even beets. If you experiment with different combinations, please come back and tell me about it! Preheat your oven to 350 degrees F. In a food processor, add the flour, sugar, and salt. Pulse 2-3 times until well mixed. Cut the butter into 1/4 inch cubes and add the butter to the food processor. Pulse until the butter is broken down into small crumbles, but do not over mix. The butter should be smaller than peas. Add the water, one tablespoon at a time while running the food processor on a low speed. When you've added the proper amount of water, the dough will come together, signaling you to stop mixing. Moving the dough onto a well flour surface, form it into a ball. Roll the dough out with a rolling pin until 1 inch larger than your pie dish. Transfer dough to pie dish. Trim off any excess dough hanging over the lip of the dish. Line the pie dough with foil or parchment paper and fill the center with dry rice, beans, or pie weights until the pie shell is 2/3 full. This will help to keep the dough from slipping down the sides. Bake for 20 minutes. Remove from the oven and discard the weights and foil/parchment. Using a fork, make holes in the bottom of the crust and along the sides. Return the crust to the oven and cook for an additional 10 minutes. Allow to cool to room temperature. Increase oven temperature to 400 degrees F. Slice the eggplant very thin. 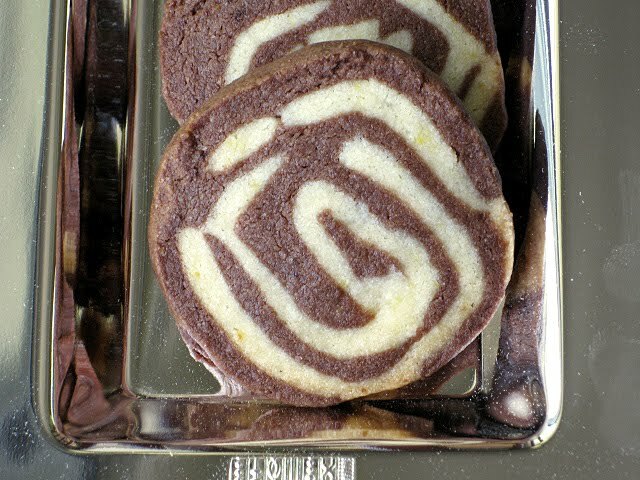 Toss with olive oil, salt, & pepper and arrange in a single layer on a foil-lined baking sheet. Roast for 10-12 minutes or until the eggplant is lightly browned and soft, but not mushy. Meanwhile, slice the onions thinly and sauté the onions for 5-7 minutes in 2 tbsp olive oil on medium-low in a dutch oven or non-stick skillet. Do not brown the onions and adjust heat as needed. Slice the tomatoes thinly and set aside on a paper towel to drain. Mince the garlic and combine with 3 tbsp olive oil. Set aside. When the onions and eggplant are finished cooking, lower the oven temperature to 350 degrees F. Begin to assemble the pie. Layer the half of the eggplant, tomato, onion, cheeses, and garlic-olive oil mixture in the pie shell. Repeat with the second half of the ingredients. Bake for 30 minutes or until the cheese is melted and vegetables are well cooked. Serve a slice with a dollop of yogurt and a few torn basil leaves. *I'm entering this recipe into the July Culinary Smackdown. I hope I'm the winner-winner-chicken-dinner! I try to challenge myself in the kitchen. Maybe it's my competitiveness (I never lose at Scrabble or dominoes--that I can remember, at least); maybe it's my risky side (who else would major in English in college with no plan for a career). Between those less-than-ideal personality traits and my impatient nature combined with a control-freak attitude in the kitchen, a recipe that requires it's ingredients to boil, chill, rest, chill, rest again, roll, chill, rest, and then finally bake was really pushing me over the edge of my kitchen sanity. It's not like all I do is cook or bake. I have hobbies. Gardening--I'm still coming to terms with our community garden failure but our herbs are growing like weeds. Sewing--would you make your mutt a dress to wear to a parade? Reading--just finished a good one and am taking suggestions for the next one. My dogs--if you had dogs this cute they would be your hobby, too. Wine--I started a ladies wine club to keep up on my wine education since I'm no longer in the business. While I was making these Black and White Swirl French Butter Cookies from America's Test Kitchen, I was wishing I was doing anything else. Weeding the garden--really hated doing that. Shaving my legs--isn't that just the most annoying thing that women have to do? Waiting at the mechanics to get my oil changed--I still don't understand why it takes so long but that's why I'm not a mechanic. Since this made nearly 50 cookies, I definitely needed to get rid of some of them so Tim and I don't eat every single one. I work in a small office, but I decided to take a little container of them in to share. I placed them out on the front of the desk with a little post-it that read, "Have a cookie!" While I was in another room, the night employee came in to relieve me. I asked him if he'd like a cookie, and he replied, "Oh, I've already had two." I said, "I'm glad you like them. I'm never making them again because they took so much work to make the vanilla dough and then the chocolate and then roll them out them out individually and chill them and then roll them together and then chill them in a log overnight and then slice and bake them this morning..."
He looked at me with wide eyes and said, "You made these from scratch? They are awesome." And that, folks, is why I will keep on challenging myself in the kitchen. I'm not going to torture you with the recipe, but if you'd like to wow your coworkers with your home-made cookie skills, I'd suggest you buy the cookbook and make sure you have plenty of patience, parchment paper, and a half a day to dedicate to baking. I'm a list-maker by nature. I think it started as a coping mechanism to deal with my memory issues but now it is a habit. Grocery lists and menu plans are my favorite after-work lists to make these days. I'm learning to adapt my grocery list-making to be more in tune with what's available at the farmer's market, but I still fill out two columns of this and that like two kinds of cereal for Tim and cooking essentials for me like olive oil and lemons. It's a sense of fulfillment at the grocery as you put each item into your cart, synonymously scratching it off your list. When I pack for a trip I make lists of everything I absolutely need before I walk out the door. I wouldn't want to be vacationing at a lake without a swimsuit or sunscreen or the necessary lounging clothes to wear while reading a good book on the dock. In fact, it's important not to forget that book, especially after all the mounting anticipation before you got your hands on it. (I finished that book already, by the way, and I can't wait to get to the market on Saturday to start making some of the recipes). So the swimsuit, sunscreen, dock clothes, and book go on the list, and are satisfyingly crossed off one by one as I pack them up. This is all probably the reason I like recipes, because each ingredient gets added in a deliberate order to make the dish complete. Everything has a reason--a purpose. It creates a little order in my crazy life. Now it's your turn. What's on your list? 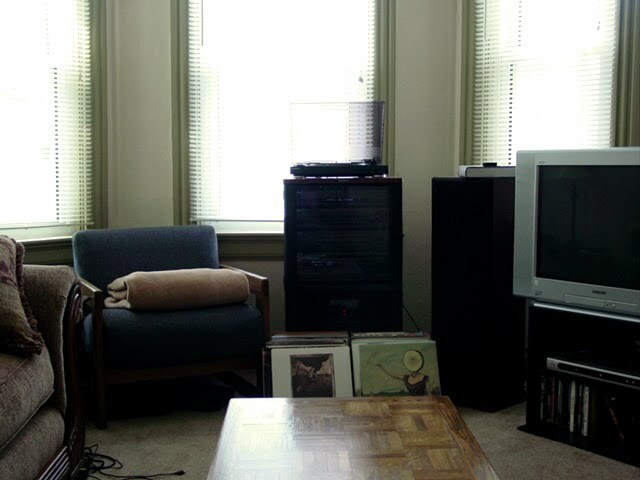 After college graduation, my parents encouraged me not to return home. They knew that my big personality was not well-suited for small town life. My little brother, on the other hand, was your typical cool-kid-in-high-school-quarterback-of-the-varsity-football-team who attends a small private college with the goal of being a teacher and coach in a small town. For him, the more wide open spaces, the better. When your name is Chip, you are destined for small town fame. So I moved to Cincinnati in such a whirlwind that it was kind of like Hurricane Jen took over the city. I took a job as a wine sales representative with a small distributor and drove around the east side of the city with a map spread out across my steering wheel. At the end of each work day, after I had visited sometimes up to twenty locations across half the city, I would open the freezer, pull out a frozen boneless chicken breast, drop it into a greased pyrex dish, pour Italian dressing over it, and bake for 45 minutes. Sometimes I would heat up a can of green beans or toss together a salad, but most nights anything else was just too much work. I was barely on my feet financially, exhausted, renting an apartment that was in a very rough area east of downtown, and uninterested in eating anything that wasn't convenient. That was five years ago and so much has changed. I have found that having a husband to help with the day-to-day things has enhanced more than just my social life--it has revitalized dinner. I am motivated when I get home to cook something that will satisfy both of us, and frankly, individually frozen boneless, skinless chicken breast just doesn't make the cut. The times I've made them lately (at the request of my stepdaughter who turns her nose up at the sight of a chicken bone), the chicken is completely tasteless, no matter how much seasoning I add. Maybe this makes me a food snob--but this is a blog about food--good food. Indulgent food. Food appreciation. When I roast a whole 3lb chicken, I am saying to it, "Chicken, I appreciate you." Just say no to tasteless chicken and try this method of brining a whole small chicken and roasting it at a high temperature to achieve a juicy, flavorful meat with a crispy skin. The recipe comes from America's Test Kitchen. The original recipe suggests adding 2.5 lbs russet potatoes to the roasting pan, presumably to soak up the juices and keep the drippings from smoking at such a high temperature. We did not have any potatoes on hand and therefore we did have a somewhat smoky kitchen (now that I think of it--no smoke alarms went off--perhaps we should be checking the batteries), but the flavor of the chicken was not affected and the chicken was perfectly roasted. 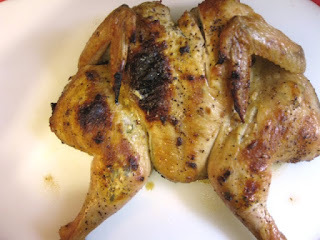 If you are intimidated by the idea of butterflying (or spatchcocking) a chicken, then I would like send you over to Youtube where you will find an abundance of how-to videos. All you really need a some kitchen shears and a little confidence and you will be good to go. Disolve the salt and sugar in 2 quarts cold water in a large container. Submerge the chicken in the brine. Cover and refrigerate for 1 hour. Pre-heat oven to 500 degrees. Be sure that the oven rack is on the lowest position. Remove the chicken from the brine, rinse well, and pat dry. Remove the backbone from the chicken and press the chicken flat, and, if needed, pounding it so that it is at a fairly even thickness. Tuck the wings behind the back. In a small bowl, mash together butter, mustard, garlic, thyme, and a pinch of pepper. Use your fingers to gently loosen the skin covering each breast. Place the butter mixture under the skin onto the meat. Press on the skin to distribute the butter. Rub the skin with the oil and season with pepper. Place the chicken on the top rack in a broiler pan that is lined with foil in the bottom. Optional: Toss the potatoes with the oil, salt, and pepper. Spread the potatoes over the foil on the bottom of the broiler pan. If you do not do this, you will likely have smoke coming from your oven, but a good hood fan and ceiling fan will help control the smokiness. It wasn't much of a bother for us and an hour later I can't smell it at all. Roast in the oven for 20 minutes. Rotate the pan and continue to roast until the skin is brown and crisp and the thickest part of the breast registered 160 to 165 degrees on your thermometer. The thickest part of the thight should be at 175 degrees. The total cooking time will be around 40-45 minutes, give or take. Transfer the chicken to a carving board and let rest for 10 minutes before serving. If you prepare the optional potatoes, using paper towels soak up any excess grease from the potatoes and transfer to a serving platter. For some, July is the beginning of summer. For me July is when summer starts to feel like more than a passing season--it's a way of life. Tank tops and strappy sandals and the cool scent of sunscreen become regulars players in my day-to-day. 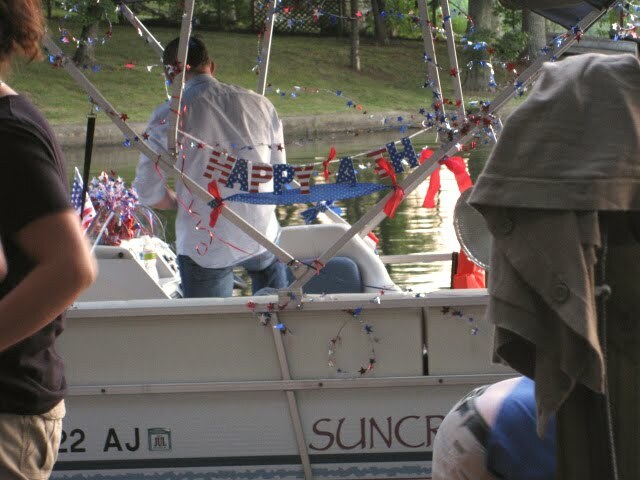 But when the 4th of July comes and goes, I start to worry that summer is in a slow downward spiral towards fall. Tonight as the sun dipped behind the trees, I wondered if it night was coming earlier than yesterday. Perhaps it is because our big summer vacation was over the weekend. We attended a family reunion and it was weekend of celebration, community, and food. 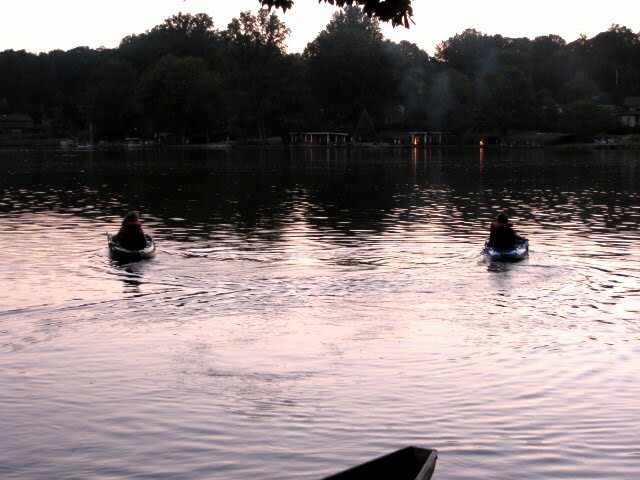 Tim's aunt and uncle live on a man-made lake in Lynchburg, Virginia, and own every lake vehicle you could possibly want to enjoy. Their pontoon boat, festively decorated by the little cousins, was perfect for lazily drifting in the middle of the lake. I was very brave and jumped into the water to bob up and down on a floating noodle. When a fish nibbled on my finger, I didn't completely freak out--only a small shriek and a few big splashes. 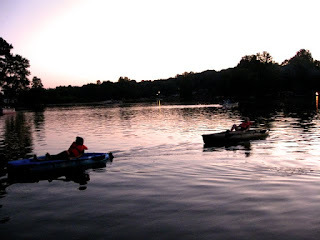 My stepdaughter and niece were masters of the kayaks. The kayaks were fit with pedals that you could pump with your feet to propel them rather than paddling. While the adults watched the fireworks from the pontoon boat and a dock, the adventurous cousins pedaled their way to the middle of the lake to watch the fireworks. Have you ever seen such a duo? These are the kind of summer memories that childhood should be made of. It's the kind of memory that digs its heels into your soul--into your history. The kind of memory that these cousins will fondly think of and say to one another in 20 years, "Do you remember that weekend we spent at the lake?" More about the food (especially the Patsy's pickles) another day. Tonight, I can still close my eyes and feel the sunshine on my cheeks and it's bliss. Neither shorter days nor going back to work tomorrow can shake this summer spirit from me yet. Yesterday morning I called my local bookstore to make sure they had the book I wanted in stock. A very nice sounding young man only took a minute checking the shelves and came back to the phone to inform me that yes, "We have three copies of 'A Homemade Life' in hardcover. I'll hold a copy for you at the counter." You see, we have a road-trip coming up soon and I do not want to be stranded in the passenger seat of my own vehicle without something interesting to read. In fact, after I read a post written by another Molly Wizenberg super-fan, I decided I absolutely had to go pick up the book for this particular trip. I know that Tim will be committed to driving for long periods of time with few breaks and I am going to need to be completely absorbed in something to make the time pass. Everywhere I look people have raved about how this book made them laugh, cry, and want to cook, so even though I'm late to picking up this book I know I will have it finished by the time we are home (or maybe by the time we get there). While we were at the bookstore, I decided I absolutely needed a new cookbook (can you ever have too many?). Tim didn't know this, but I had already decided which one I wanted before we even left the house. There was only one copy of How to Be a Domestic Goddess and it left the store in my bag. Nigella Lawson has always been one of my favorite food writers and cookbook authors, mostly because of her va-va-voom style and sly charm that makes me think she just might wink at me when she finishes a sentence. I sat down last night and began reading this cookbook just as if I were reading a novel. As Tim fell asleep, I was still sitting up in bed with the reading lamp on absorbing tips and tricks about baking. Her foreword is absolutely spot on when she says that being a "domestic goddess" is more a state of mind rather than any action you perform. Doesn't it make you feel good to bake a cake? Don't you feel proud when you make scones from scratch? I'll answer for you--yes and yes. The only difficulty with the book is what I'd consider a language barrier. I have spent a good chunk of time today translating her British slang, metric measurements, and Celsius temperatures. Did you know that dessert is referred to as pudding over the great Atlantic pond? That took me a while to catch on to that--for a while I assumed she was talking about a mushy cake! Complicating matters further, I am fairly new to baking (Tim is the baker in this family) and I don't own a scale. More time was spent googling different opinions on how grams translate to volume for dry ingredients. I think I got it figured out, but I imagine that any recipe would be even better if I were to do it completely as it was written. 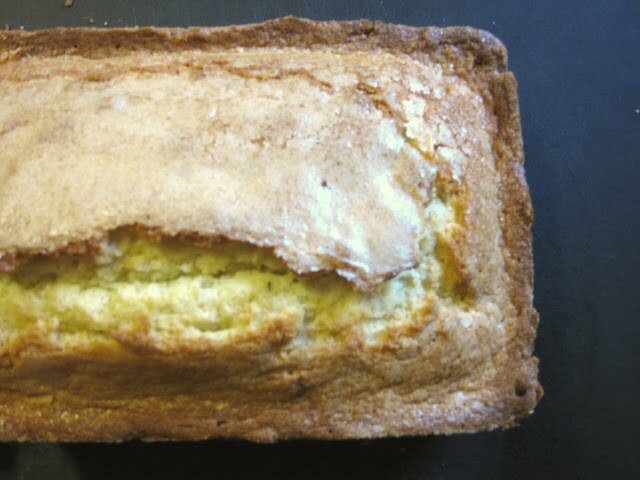 A recipe for a Rosemary Loaf Cake really stood out to me. For one, I recently saw another favorite blogger of mine make an Olive Oil Cake that contained rosemary and also because the rosemary plant in my backyard is finally starting to take off. Rosemary may seem like an odd choice in a dessert, let alone a cake, and Nigella addresses that. She said to just trust that the flavors of sugar, vanilla, and rosemary would be a complimentary. 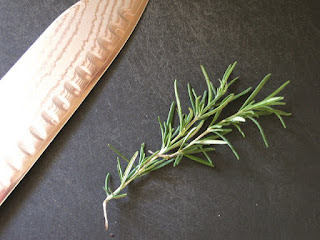 Two teaspoons of rosemary in this recipe may seem like a very small amount but it definitely created wonderful aromatics in the house while this was baking. Assuming my translation from mass to volume was correct, I thought that the crumb of this cake was perfect. 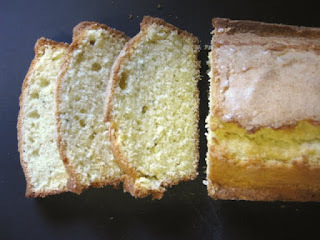 It was slightly crumbly, sort of like a corn cake, but very soft and moist in the middle. The flavor was distinctly sweet, with a perfectly sugary top crust. The hint of rosemary was in the forefront of its taste and, wouldn't-you-know-it-Nigella-was-right, complimentary to the vanilla as if they were the epitome of sugar and spice. Nigella suggests serving this with cold stewed apples or other fruit, but that didn't strike my fancy tonight. I had one slice before dinner and a second one after just to be sure it was as good as I had remembered it being 30 minutes ago. I think if you wanted to serve it with something, I'd go with a nutty ice cream or a basil gelato (the latter being something my friend Meg has already commissioned for her birthday this fall). *If you do not have self-raising flour, you can do what I did and sift together 1 2/3 cup all-purpose flour, 1 tsp 3/4 tsp salt, and 2 1/4 tsp baking powder. Thanks to Bob at Cooking Stuff for the timely post. Preheat oven to 325 degrees F. Sift together the 2 flours in a medium bowl. In the mixer bowl, cream the butter until it's really soft and then add 3/4 cup sugar, creaming both together until pale, smoothe and light. Beat in the eggs one at a time, alternating egg and then 1/3 the flour, then egg, and so forth. Mix each until just incorporated and be careful not to overmix. Then mix in the vanilla. Fold in the rosemary. Stir in the milk to thin the batter. Pour into a greased and floured loaf pan. Sprinkle the top with the additional 2 tbsp sugar. Bake for 60 minutes or until a toothpick comes out clean. Leave to cool in the loaf pan on a wire rack until it's completely cooled. Slice and serve or wrap well in tin foil until serving.